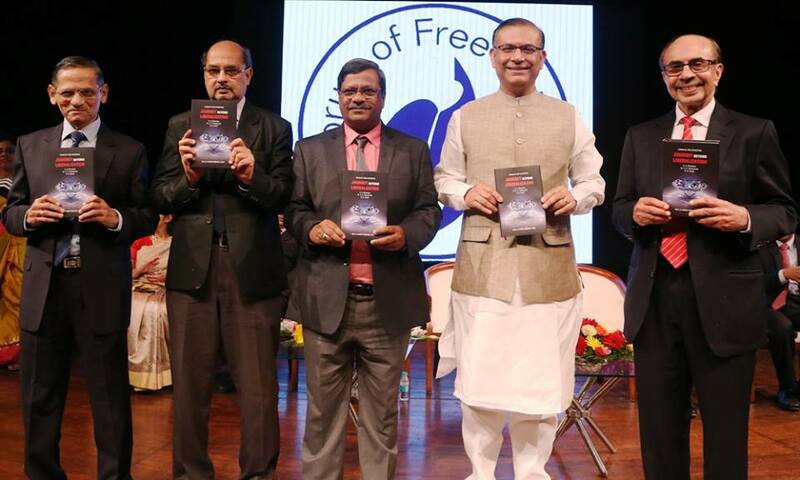 The book titled ’JOURNEY BEYOND LIBERALISATION ‘, co-authored by Shri S S Bhandare, Dr Chandrahas S Deshpande and Mr R G Katoti was published by the Forum of Free Enterprises, Mumbai at a glittering ceremony at the NCPA,Mumbai. It was released by eminent industrialist, Shri Adi Godrej at the Diamond Jubilee Celebrations of the Forum on 29th September 2016 in the presence of Hon’ble Shri Jayant Sinha, union Minister of State for Civil Aviation. 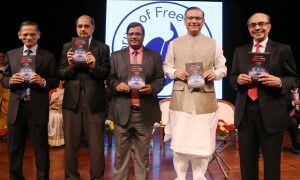 The book traces the path traversed by the Indian economy and policy over the last 25 years since 1991.It offers a succinct overview of the policies introduced and economic performance achieved by the Indian economy, – against the backdrop of pre-1991 years.A salient feature of the book lies in its identification of eight “transformational changes” such as – Urbanisation, Financial Inclusion, Aspiring Middle-class, Entrepreneurship etc., – which are steadily unfolding as the emerging ‘game-changers’ for India’s future. As regards, policy-recommendations, the book spells out a “Ten Point Agenda”, which needs to be adopted by the Govt. to transform India into a middle-income nation in the world, by 2040. The book has been published by the Forum of Free Enterprise and was released at its Diamond Jubilee Celebration on September 29, 2016. Dr. Chandrahas Deshpande has a combined experience as Professional Economist of over three decades in – Post-Graduate Teaching and Academic Research; Policy Think-Tank; Trade Promotion Organizations and Private Corporate Sector. (1985- till date ). Dr. Chandrahas Deshpande is currently Professor (Economics), at the Welingkar Institute of Management Development and Research (WeSchool), Mumbai and attached mainly to the MMS and Autonomous PG Programs.He teaches and mentors young management students in ‘Business Economics’; ‘Business Environment’; ‘Macroeconomics and Indian Economy’ and is involved in faculty research projects as well.